I recently saw a documentary which suggested that the tigers can use sonar or low frequency sound to mesmerize its prey and so prevent it from fleeing thereby catching it. I disagree, I think the tiger is an intelligent master stalker, surprising its prey by stealth or lying in ambush. Silence and surprise is the key to the tigers success as a hunter, not the use of sound. Where I think the tiger uses low frequency, is in the defense of territory or defense of its kill. Can the low frequency growl affect human beings I believe it can. Consider the following, I am a member of the tiger pride so to speak. Ron is the dominant male patrolling the area. Mostly he is on his own marking territory, occasionally he visits Julie, the cubs and myself. Julie is the matriarch and main hunter providing for herself and three cubs and Ron when he pirates the kills. I sit somewhere low in the hierarchy, mainly because of my relationship with Julie. So far the cubs have tolerated me as an outside observer, but this is beginning to change. So far Julie has been very successful catching wildebeest and blesbuck. 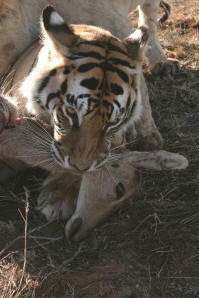 Recently she has moved away from these two species and is catching mountain reedbuck. The mountain reedbuck weigh around 28kg. Immediately Julie makes the kill the dominant of the two tiger cubs, Tiger Boy, takes the kill. If Ron is not around, no other tiger competes with him. 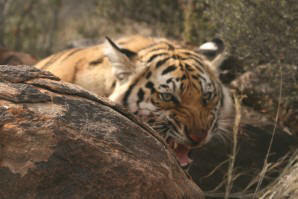 Tiger Boy will easily take 14 to 20kg from the kill. By the time Shy Boy and Savannah get there turn, there is nothing left for Julie. A situation is emerging where the main hunter Julie, who needs to keep her strength up, is getting the least meat from the kills and her condition is dropping off. This situation is causing me some concern especially due to my close relationship with Julie. Consider the following scenario. Julie catches a mountain reedbuck on a rocky koppie. Unable to move the film vehicle in, I go on foot. I take a movie camera, a stills camera and a low frequency recorder. I place the movie camera on a bean bag to record the action. 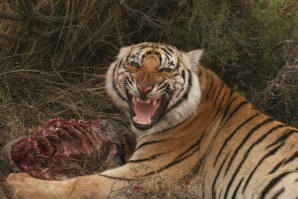 I begin to circle Tiger Boy who has the kill, taking still pictures. I have with me my stick and my unloaded revolver strapped to my waist. As I circle, Tiger Boy emits a low rumbling growl. I get the impression that parts of the growl are below my hearing capability. This continues for 20 minutes. I move closer to Tiger Boy and then kneel down to take a picture. Perhaps because I am now in a submissive position, he lines his body up, his legs are bunched, the lips curled back, canines gleaning in the morning light, the tail flicks back and forward. The growl increases in volume reaching a crescendo and then he comes straight for me in a terrifying charge. One hundred and eighty pounds of pure fury. My brain reacts, instantly I move to fight rather than flight mode, I stand up right, I shout and as he comes in, I hit him with my stick. He rears up, trying to rake me, the stills camera crashes to the ground. 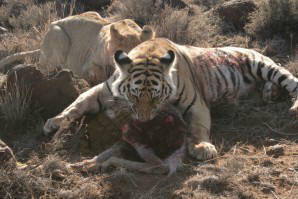 Julie and Shy Boy both go for the kill, Tiger Boy wheels and attacks them, both give up the kill immediately. Tiger Boy has made his point, the balance of power has shifted, I can no longer simply walk in on his kill, I can no longer cross the imaginary line. In short, he and not me is now dominant. It has taken him one year to assume the dominate role. It look me several minutes to recover myself and I was loathe to go back and recover my movie camera. As the shock wore off, I became anxious. The anxiety stayed with me for several hours. Try as I may, I could not shake the anxiety off. Later when the growls are slowed down on the computer, it emits a eerie sound, much like the sound they use in the movies when the actor is in a haunted house or a graveyard or a serial killer is on the loose. In a controlled experiment, the documentary shows various people being played low frequency growls. Although they have no idea of what the sound is, all register fear and anxiety. The three months of freedom for the tigers, have been intensely interesting. Ron spends the majority of his time patrolling and marking territory. Many of his hours, are spent on his eastern boundary, growling at Seatao through the wire. He begins with a low rumbling, leading to a deafening growl as he charges the fence. Seatao offers no resistance, he replies by "chuffing " greeting in Tiger language then he moves off. It is here that I believe Ron is using sonar sound to intimidate Seatao. I believe Tiger Boy is using sonar sound to intimidate Julie, Shy Boy, Savannah and myself when we get too close to his kill. In my case, he believes I am puny, I have no teeth, no claws and can't growl, so I am an easy target. Did the growling have an anxious effect on me, you bet it did!